Wilde Calm Records present a new EP of modern percussion edits from Brooklyn producer Boonlorm. 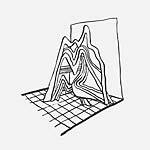 This collection of reworks was started around the same time Boonlorm began recording String Figures, his album of prepared piano house music (SDGWC 1401CD, 2014). It shares a similar sound to String Figures' rich combination of tonal, atonal, and percussive timbres. By adding his raw drum programming to tease out the latent "techno" qualities in these modern percussion opuses, Boonlorm once again pays homage to Chicago, Detroit, and the 20th century avant-garde. "Last available copies of this 2012 EP String Figures, the latest project from Pocketknife working under his new moniker Boonlorm. A six track EP featuring 'piano not piano' house music created solely with a prepared piano and raw drum programming that pays homage to Chicago, Detroit, and the 20th century avant-garde. String Figures buzzes, vibrates, and jacks all at once. Edition of 500 vinyl copies; screenprinted covers; full-colour insert." This is the first project from Brooklyn DJ/producer Pocketknife (Tambourine Dream, Flagrant Fowl) working under his new moniker Boonlorm. An 11-track album featuring "piano not piano" house music created solely with a prepared piano and raw drum programming that pays homage to Chicago, Detroit, and the 20th century avant-garde. String Figures is "screw music" in the most literal sense, with direct ties to the late composer John Cage, who created the first prepared piano pieces by inserting objects into the strings of a grand piano. The sound that resonates is a rich combination of tonal, atonal and percussive timbres. String Figures buzzes, vibrates, and jacks all at once. This CD edition contains six remastered tracks that appeared on a limited vinyl that came out in 2012, with four additional tracks from the same sessions, as well as a bonus track called "Hairdo Gone," which is an homage to Lil Louis' "Video Clash."